A view of the Milky Way galaxy in microwaves, captured by the European Space Agency's Planck satellite. The different colors correspond to different elements, including gas, dust, and energetic particles. The Milky Way galaxy is made up of more than just stars and a new series of galactic maps has captured that diversity of gas, dust, particles and magnetic fields in amazing detail. 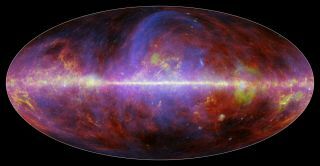 The new Milky Way galaxy maps are based on observations by the European Space Agency's prolific Planck space observatory. They show the Milky Way in four distinct color signals that, when combined into a single mosaic, create a hypnotic view of our home galaxy.The Planck satellite observed the oldest light in the universe during its mission. In the new Milky Way maps, red colors indicate dust, yellow is gas, green is high energy particles, and blue is the magnetic field. "Planck can see the old light from our universe's birth, gas and dust in our own galaxy, and pretty much everything in between, either directly or by its effect on the old light," Charles Lawrence, the U.S. project scientist for the mission at NASA's Jet Propulsion Laboratory in Pasadena, California, said in a statement. A view of the Milky Way in microwaves by the Planck satellite. The top view is a combination of the four bottom slides. Each of the four slides shows a different element: top left is dust, top right is gas, bottom right is light from charged particle interactions, and bottom right shows charged particles moving along the galaxy's magnetic field. The Planck satellite was built to detect microwave light, which made it sensitive to something called the cosmic microwave background, or light left over from the big bang. Planck's study of the cosmic microwave background is helping scientists answer questions about the very early days of the universe, such as when the first stars were born. With its microwave vision, Planck can detect more than just the cosmic microwave background. One of the new Milky Way images released by the Planck collaboration is an overview that shows four separate galaxy views, as well as the final view of them combined. The red version (upper left) show the heat coming from dust throughout the Milky Way galaxy. Planck can capture this thermal light even though the dust is extremely cold — about minus 420 Fahrenheit (minus 251 Celsius). This map of the Milky Way shows the distribution of interstellar dust across the galaxy as seen by the Planck space observatory, a mission by the European Space Agency. The yellow version (upper right) shows carbon monoxide gas, which is concentrated in areas where new stars are being born. Meanwhile, the blue image (lower right) shows light created when charged particles get caught up in the Milky Way's magnetic field, and are pulled along like a swimmer in a current. The particles accelerate to nearly the speed of light and begin to radiate. The green image (lower left) shows light that is created by free particles that zip past one another without quite colliding. This kind of light is often associated with hot, ionized gas near massive stars. The $795 million Planck satellite launched in 2009 and collected data for just over four years before being decommissioned in 2013. Last week, the collaboration released the results of a much-anticipated joint study with the BICEP2 collaboration. In March 2014, BICEP2 announced what some scientists took as evidence of inflation in the early universe and evidence of gravitational waves. But the results of the join analysis showed that BICEP2's measurements were contaminated by space dust.